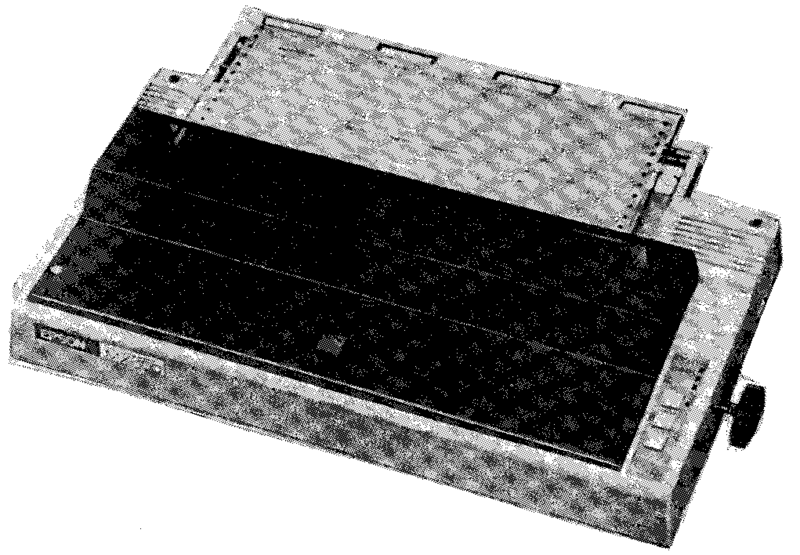 This is claimed to be the world's most successful range of computer printers, and certainly its adoption with only a change of badge as the printer for the IBM, Sharp, PET and HP microcomputers lends weight to the idea. This version has a 99 dot matrix which allows true descenders, operates at 80 ch/s, programmable font variation to give 40, 66, 80 and 132 characters per line, plus emphasised and enlarged characters. The unit comes with a tractor feed mechanism which can be easily detached and then cut sheets of paper used as in an ordinary typewriter. The rubber plattern helps to reduce the printing noise, arid improves the standard of printing. "Chunky" graphics are also standard on this version. This is broadly similar to the MX 80 F/T model 1, but has high resolution graphics capability with individual dot addressablity. Again similar to MX 80 types above, but with true 1:1 ratio screen dump. Ie a circle is printed as a true circle. The high resolution graphics give 1152 dots to the line. This version does not have friction feed. As the Epson MX 82 above but with the choice of demountable tractor drive or friction feed. What could be better than increased performance coupled with low price? MX 100/3 is upgraded from 80 to 100 characters/sec, and has had more programmable features added that includes subscripts and superscripts, improved graphics, auto underlining and enhanced aesthetics. At the same time the price has been decreased from £575 to £495, to what must be one of the best buys around in matrix printers. This printer produces text and graphics in 7 colours by single, double and treble printing using a three colour ribbon (magenta yellow and cyan). Each printer dot is individually addressable for high resolution colour graphics. The text format is 5x7 matrix for the 96 standard ASCII characters, 6x7 matrix for 64 PET graphics characters, plus 15 user programmable characters. This is one of the most competitively-priced daisy wheel printers on the market, and yet offers a wide range of sophisticated features. It is provided with a standard 2K print buffer, and internal software which achieves compatibility with word processing and wordstar programs. The standard midels have a rubber plattern and are designed to be used with single sheets of paper like an ordinary typewriter, although motorised paper advance makes paper loading exceptionally quick and easy. Alternatively, a tractor option is available which handles standard computer paper with holes along the edge. There is also an automatic loader for single sheets of cut paper, called a sheet feeder.